Dun dun. Dun dun. Dun-dun-dun-dun-DUNDUN! Oh, wait, it’s just your adorable shark baby! Listen, parent, we know that it’s not exactly a normal Tuesday to have a baby and then find out it’s a shark, but it’s actually not as big of a deal as you think! For one, it could have happened to anybody…actually, we’re not even sure how it happened, we’re just sure that we don’t want to make you feel bad about it! After all, we know you stayed away from the sushi, and it’s not like you had an amorous affairs with a shark (or did you…?). No matter how this shark baby came to be, let’s just not lose sight of or forget the most important thing: They’re the cutest little shark baby in the world, on land or in sea! 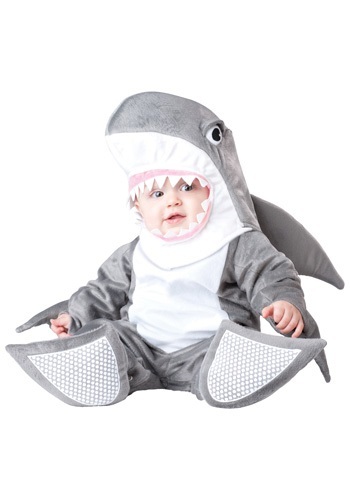 So get that ocean infant in the right clothes to match with this Infant Silly Shark Costume! It’s 100% polyester, which will keep your baby comfy cozy for as long as they’re swimming in it! It zips up in back and also has snap buttons along the leg inseams for easy diaper changing. The fin-shaped booties have elastic around ankles for a comfy fit, and the the hood Velcros on in front (so it can be easily removed just in case your baby reacts to hoods the same way ours do!). The adorable dorsal fin is also attached to the back of the hood. So this Halloween, have the cutest little ocean baby ever with this Infant Silly Shark Costume. This cute costume goes great with our mermaid costumes too!